Prayerful Readings: These readings focus on the character of God in the context of Scripture. 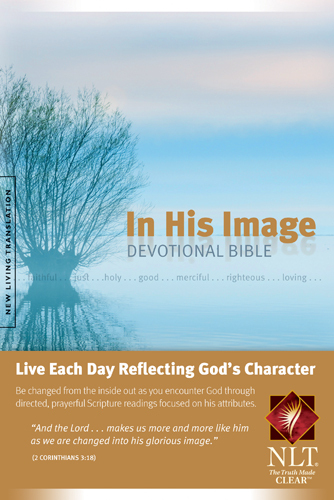 The book contains 18 features on each of 15 attributes of God (a total of 270 readings). Response to God articles: These 57 articles are also based on the attributes of God, but center on ways to apply the principles to our lives. God's names and titles: Short items beside the text detail the various names of God and the meaning of each. Book introductions: At the beginning of each book is a page or two that provides the purpose of the book (e.g., the purpose for Psalms is "To provide Israel with a collection of songs for worship appropriate for a variety of situations"), a short overview, a few verses that reveal God's character, and a section called "Meeting God." As an example, "Meeting God in Psalms" indicates that three of the most significant attributes of God's character in Psalms are God is Worthy, God is Imminent, and God Displays Glory; each of those attributes is accompanied by an explanatory paragraph. Character of God articles: Each of these 15 articles explains one attribute and links it to Scripture references. Divine Attributes Master Index: This section indexes all of the other features by attribute. For example, under God is Faithful is a checklist including the attribute article, 18 Prayerful Readings, 3 Response Articles, and (about) 21 Name or Title features. To give an idea of how much added content is in the In His Image Devotional Bible, I surveyed the pages of Genesis. Across the 53 pages, I counted 30 extra features. I like the features of this Bible a lot! I'm fascinated by studying the attributes of God, so this is perfect for me. I think it would be an exciting way to learn more about the character of God through His Word. Trim Size: 5 1/2 x 8 1/4 in. Disclosure: I received a copy of this book, at no cost to me, for review purposes. I was not required to write a positive review, and all opinions in this post are my own. This post contains an affiliate link: if you click through my Amazon.com link and complete a purchase, I will receive a small commission. Thank you! Sounds like a really good devotional Bible. Tyndale usually puts out really nice things anyway :) We have one that we purchased years ago and we really learned a lot but for the life of me, I cannot remember the title of that one. It was a NKJV Bible but it had a lot of really good commentary.